Thanks to Hector de Leon from the County Clerk’s Election Office, I’ve got my hands on the latest on the county voter registration rolls. FYI, when they break down the Hispanic numbers, they’re just estimates since they go by surnames. When registering, we are not required to give our ethnicity. That said, there are 2,119,052 voters whose status is active. And of that, 470,041 are Spanish surnamed. That’s 22% of the voter rolls, folks. And if 20,000 or so would fix their status, we’d be closer to 500,000. When broken down by congressional district, the county finds that 57% of voters in CD29 are Spanish surnamed. But in a show of “we’re everywhere!” we are anywhere from 14 to 22 percent in the other CDs. In the “hotter” races for CD2 and CD7, Spanish surnamed are 16% and 14%, respectively. In my own very Democratic CD9 and in Congresswoman Sheila Jackson Lee’s district, Spanish surnamed are at 19%. But when one looks at CD22 and CD36, which are quite suburban, Spanish surnamed are at 22% and 20%, respectively. We’re everywhere! And this is a good thing because the ability to impact elections in Harris County is not just in one particular area, and “control” of GOTV efforts are not in any one group of politicos. On the other hand, there is plenty of opportunity to GOTV for those who really want to put in the effort and money. [I’m talking to those big money raisers and groups who GOTV, now.] 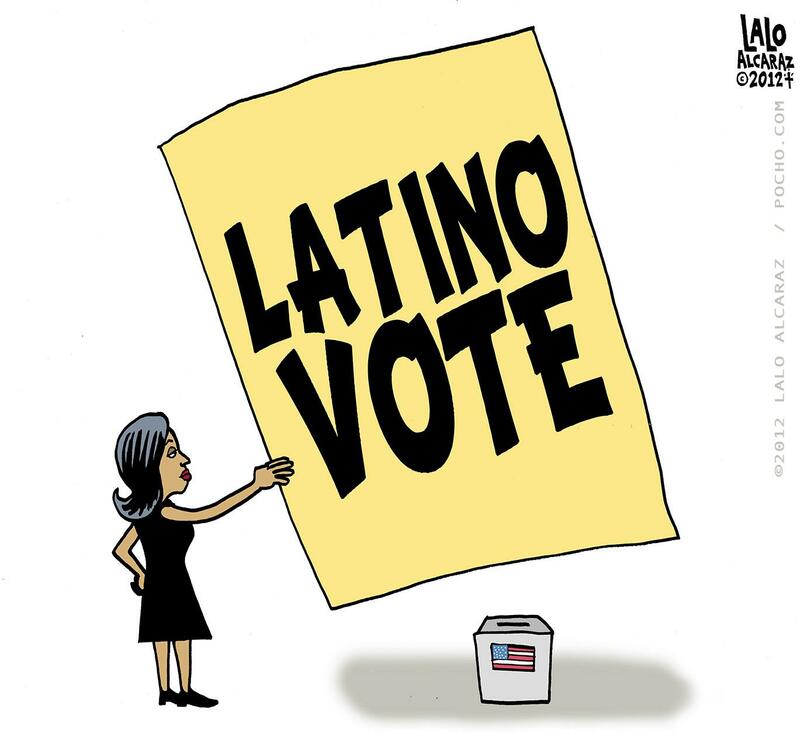 Particularly when it comes to registered non-voting Latinos who often go ignored, or easily scapegoated, depending on the political party. One particular set of data to note is how County Commissioner’s seats are broken down. What used to be a stronger Hispanic opportunity precinct, Precinct 2, is at 39% Spanish surnamed. I recall arguing before the County’s redistricting lawyers that while I appreciated Precincts 1 and 4 becoming more Hispanic and it seemed like a good thing because it showed we’re everywhere, it wouldn’t take much cutting from both precincts to bolster Precinct 2 as a Hispanic opportunity district. They didn’t listen. This is important as Latino candidates in the Pct. 2 Democratic Primary fight for whom gets to the chance to knock off a GOP incumbent, thus adding some needed diversity to the Court. I guess it’s important for those of us seeking partisan balance at the County, too. There’s some 2014 data through which I need to sift that gives a clearer picture about where Latinos voted and in which Primary in 2014, and, no surprise, one finds those more “conservative” ones in the more suburban areas of the county. Has there been much change in how these Latinos feel about one side versus the other after a year of Trump? Are there new voters who haven’t even been given attention by either side? Well, I wish Latino Decisions would give it crack to find out. Anyway, no doubt there has been growth. Voter registration efforts continue and there’s plenty of time to further impact these VR numbers toward November. What this tells either side of the political spectrum is that upwards of a quarter of the voter rolls are up for grabs if a political party takes that segment seriously in its GOTV efforts. As Tony Diaz and I discussed on Tuesday on his radio show, it takes more than speaking Spanish and eating a taco in public. It takes being in tune to where Latinos are on the big issues. Those are usually Education, Health Care, Economy (jobs), and of course, Immigration. And I’m pretty sure a lot more of us are listening–whether you’re speaking to us or not. And that’s how November decisions are made. Anyway, this is where we’re at regarding voter registration. This entry was posted in 2018, Accion, City of Houston, Cultura, Democratic Stuff, Elections, Historia, History, Local Politica, Voting Rights. Bookmark the permalink.